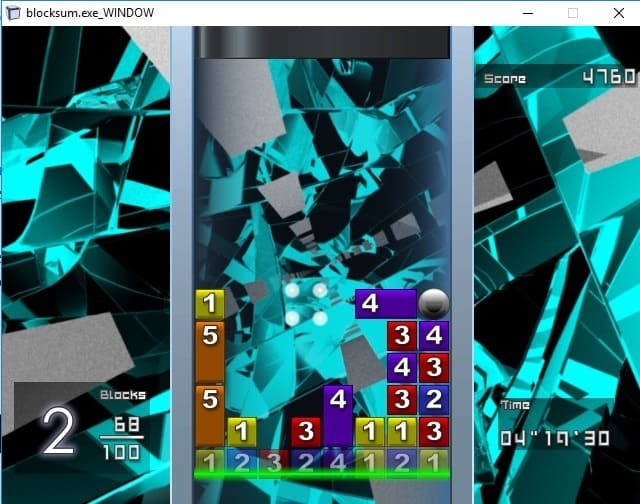 Blocksum is a puzzle game for Windows PCs that mixes elements from Tetris, 2020 (if that game existed back in 2007), and Dr. Mario. Whereas you try to fill lines completely in Tetris to remove them and move blocks of the same number next to each other in 2020, you use basic math in Blocksum to create adjacent blocks of the same sum to have them all removed at once. Blocksum is a Japanese game that supports English. The official website of the game is this one but I made the decision to link to Archive.org in the Summary box for easier downloading. Blocksum's level layout looks like Tetris on first glance but you will notice quickly that Blocksum is not just a cheap copy of Tetris but a game that stands on it on. Blocks scroll up in Blocksum and you need to make sure that they don't cross the line at the top for too long because it is game over otherwise. Individual blocks with numbers fill the level and it is up to you to combine blocks to create a larger number and then combine blocks adjacent to the newly created block sum to have them removed at once. A core rule of the game is that you need to create as many adjacent blocks of a number as the number that is listed on a merged block to have all of them removed. You can create, and should, create more blocks if the layout allows for it. For example, if you merge four blocks with the number 1 you get a number 4 block. You then need to merge other blocks so that their sum is 4 that are adjacent to that block to have them removed at once. Blocks that reach the threshold are removed after a short period which you can extend by creating new adjacent blocks that match the sum. There is also a black hole special block in the game that appears at times. Select a number and then the black hole block to have all blocks of that number removed from the board. Blocksum supports Controller and keyboard playback. I suggest you open the settings on first start to map keys before you start. Use the cursor keys and Z(Y) to navigate the menu and select items. Please note that Blocksum requires DirectX 9.0c and that you may have to install it separately on your Windows machine. You can download the DirectX Web Installer from Microsoft. Blocksum is a great game. It plays quickly and the math skill that you need is limited to creating sums which even young children should not have lots of issues with. The game is all about getting the highest score possible. While that may be motivating to some, I wish the developer would have added other game modes or even multiplayer to mix things up a little bit. All in all though, it is a great game that aged well. Now You: Do you like puzzle games? Different strokes. I rather enjoy puzzle games, personally.